All day in my back garden, the resident robin entertains with his tuneful songs. Not easy to spot him, now that his colours merge with the new leaves and blossom ! Aaaaw lovely picture not surprised he's singing surrounded by all that lovely blossom :-). what a great picture! love the way you snapped him in song, I can just here him in my head. You have a real knack of capturing little Robbie! Lovely photo! So cute....what a good photo, TT. A charming picture T T.
that's a lovely pic, and you got him in mid-trill, too. not seen any robins round here yet, but there's loads of "free trees" and shrubs for them to find homes in. I hope your free trees are soon full of pretty song birds. lol can hear 'em, next job is to identify them! Beautiful photo you ve captured there Terratoonie, such pretty blossom too. the robin seems very happy ... sings all day ! 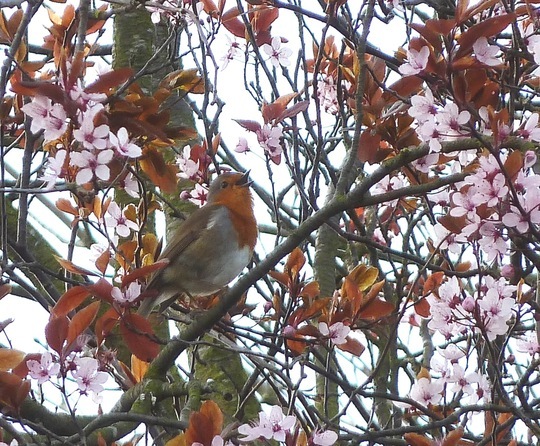 A clear sky,wonderful blossom and a lovely robin singing for you ... magical. any chance you could capture a video with sound? it'd be ahgit on YouTube!! lol can we gat a GoY YouTube channel? we could watch vids of paople's gardens, get moving tours, and exhcange birdsong! Will the Robin be entered for Britains got tallent .he he. A truly stuuning photo - the RSPB would like this one Terra! agree with Wildrose, but, lol, make usre you put a (C) on it!! in fact, if you could produce posters of this pic, I'd buy one! He entertains out there all day ! Musical posters sound great, Fran ! wonder if he's advertising or warning other males off? He is so happy because he is in your beautiful garden. The robin is still singing every day, but it isn't easy to see him because the trees have grown all their leaves !